This week, Good Girls Get Rich features, guest, Jamie Broderick, a visibility strategist who helps entrepreneurs become market leaders by building their platform, leveraging their connections and shining the light on their unique talents. We would love to hear what you think! Send us a message on SpeakPipe! Or you can email [email protected]. We look forward to hearing from you. A visibility strategist who helps entrepreneurs become market leaders by building their platform, leveraging their connections, and shining the light on their unique talents. Her endless creativity and knowledge has gifted her with the uncanny ability to connect people together and provide just the right advice. 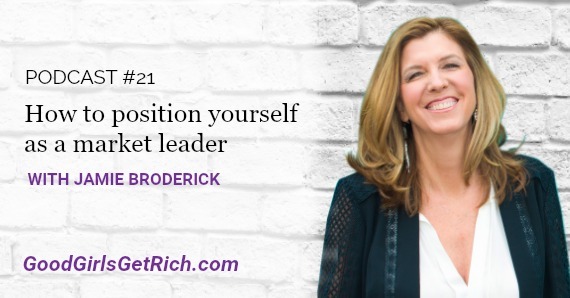 She leads a business support network that she founded 10 years ago called The Success Connection, which provides market leadership training in her course, Above the Crowd, and hosts two annual confidence building retreats in Florida and New York. She also co-produces TEDxLincolnSquare in NYC. What are the kinds of things you need to be perceived as the leader in your market? Do you want to be the market leader? When you have online credibility and media appearances, it opens a door to new [larger] connections, which leads to visibility and then even more credibility. Owning it. Confidence is the first step. And remember, to get started with Karen, join the revolution, 21 simple online branding and LinkedIn strategies to skyrocket your business success!It would be awesome if you shared the Good Girls Get Rich Podcast with your fellow women entrepreneurs on twitter. Click here to tweet some love! If this episode has taught you just one thing, I would love if you could head on over to Apple Podcasts and SUBSCRIBE TO THE SHOW! And if you’re moved to, kindly leave us a rating and review.